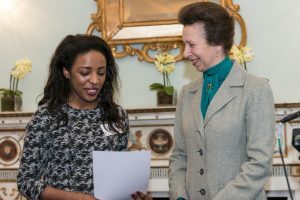 Former Red House pupil and public speaking champion Nathania has been presented with her national accolade by The Princess Royal. Nathania was awarded the title of ‘Best Speaker’ in the English-Speaking Union’s Public Speaking competition and later went on to be crowned winner of The Winston Churchill Cup for Public Speaking. As a result, Nathania was invited to honour Sir Winston Churchill with a reading at a memorial service for the former Prime Minister. 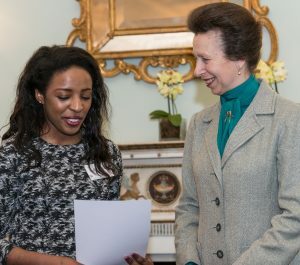 Nathania attended the ESU’s annual presentation event at Dartmouth House in Mayfair last week and was presented with her official winners certificate by Anne, Princess Royal. Red House School consistently performs well in public speaking. Mrs Fryer, Head of English, works extremely hard to enhance our pupils’ public speaking skills and has done so for the last eight years. Mrs Fryer successfully coached Nathania and the Public Speaking Team which resulted in Nathania winning the ESU Best Speaker in the Country and the Winston Churchill Cup.